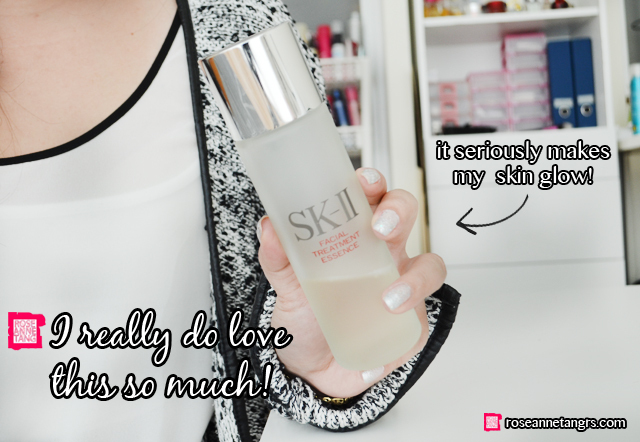 Review: SK-II Facial Treatment Essence! To be honest, this review of my beloved SK-II Facial Treatment Essence has been a long time coming. 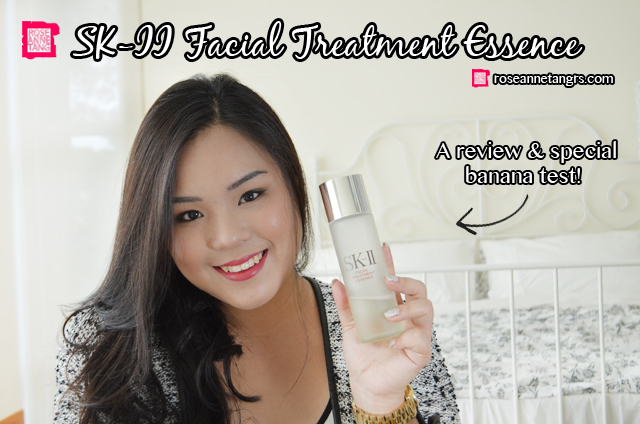 I’ve been using the SK-II Facial Treatment Essence for about a year and a half, but I don’t think I’ve ever really done a full review on it before. 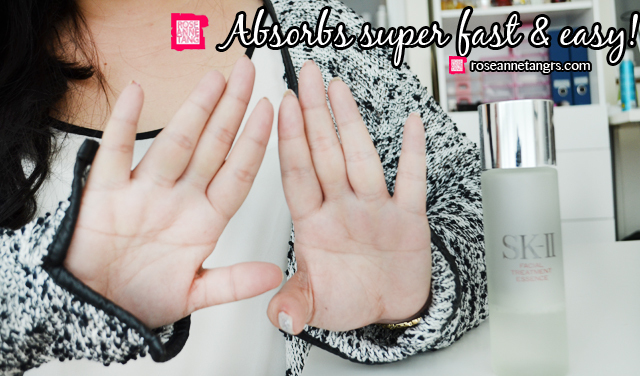 Yet, it’s been in my past and current favourites as one of my must-have skincare products. Today, I thought I would get on that. I love this stuff so much and have been using it a lot and have already gone through two bottles! I’ve stocked up in my drawers as well because seriously girls, it’s really worth the hype. 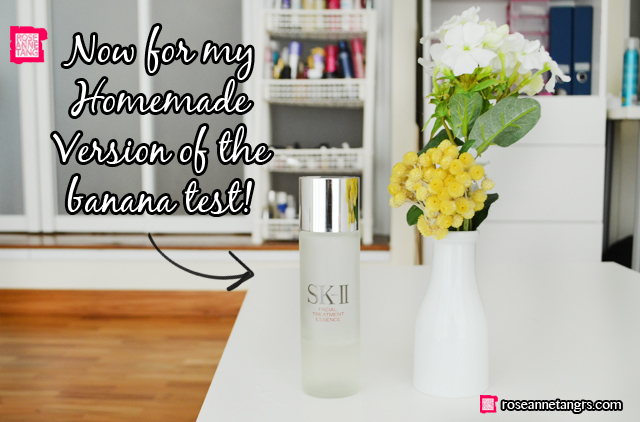 I’ve also done a cool little banana experiment that I saw in a video on the SK-II facebook page and thought I’d try it to see if it really worked! So how did my love for this all start? Well I received this product about a year and a half ago, close to two years and yes, I was skeptical at first. I mean everyone says that this ‘miracle water’ changes your life but of course trying many products, I was hard to convince. The SK-II Facial Treatment Essence looks so much like a toner and I thought it was until I realised that it is actually a concentrated “serum” instead. It looks and feels just like water but it has an interesting Pitera smell and when I first smelled it, it wasn’t that pleasing to the nose. 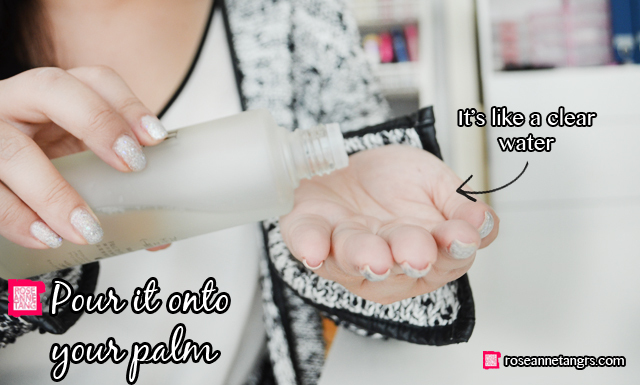 However, it does grow on you and if you use the treatment essence regularly, you really don’t smell it anymore. For the two weeks or so, I was kind of disappointed with it. I saw no improvements at all in my skin and was really bummed out because everyone was crazay about it. Then, one morning I looked in the mirror (during the third week), I saw a MASSIVE improvement in my skin. I had a glow that isn’t an oily glow but a glow from within. I know it sounds super cliche but it was like my skin was wearing a natural highlight. It’s really hard to explain but I’ve never met and have yet to meet another skincare product that produces the same result. It’s really special and something that I highly recommend as it does really give you glowing skin. From the bottom of my heart. From then on, a lot of people started noticing changes in my skin. Even you guys in my videos noticed my skin just glowed and it’s all thanks to the SK-II Facial Treatment Essence. As a beauty blogger, I’m constantly trying new skincare products too but when I have a break, I find myself always returning to SK-II and loving it all over again. 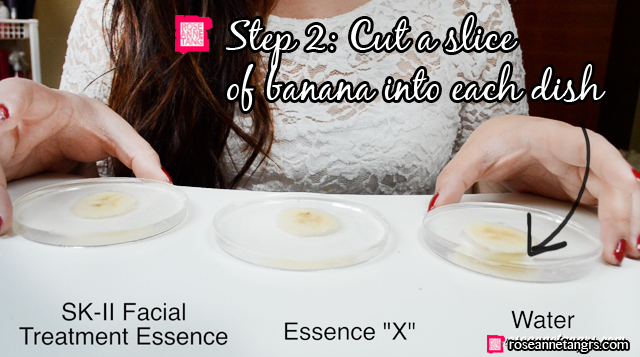 So while on facebook, I saw a video of this test where a scientist puts a slice of banana into three petri dishes each with different liquids – water, essence e and SK-II facial treatment essence. 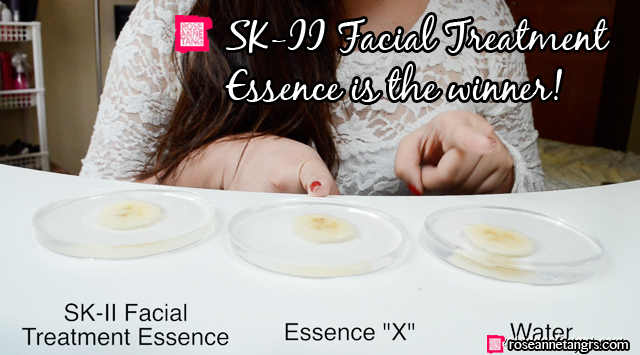 Surprisingly, after an hour and a half, the bananas showed less oxidation and browning when in the SK-II Facial Treatment Essence than in water and essence e. That shows that the essence protects your skin the best and actually prevents skin damage from external pollutants. So I was like, hey why not do the test for my review! 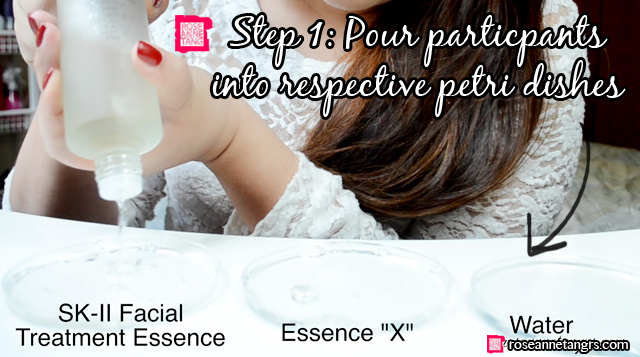 I have three petri dishes, water, another essence which I call essence ‘x’ in my video and of course the SK-II facial treatment essence. I filled the petri dishes with the respective liquids. Then, I cut a slice of banana into each of the petri dishes! I left it to soak for 45 minutes to see what would happen and if that video is actually true! After 45 minutes, I have to say they weren’t just for show! It was so cool to see this! 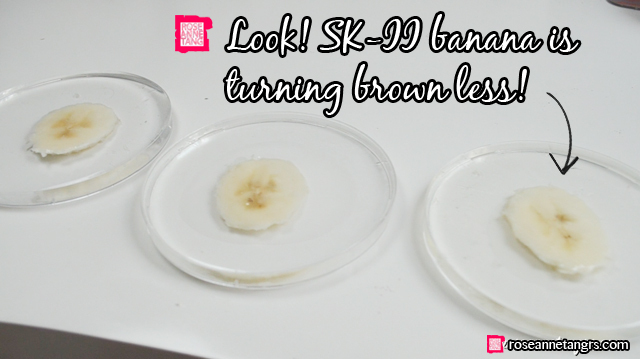 The banana soaked in the SK-II Facial treatment essence really did turn brown less than the other two! I don’t want to reveal what I put for Essence X because that’s well plain mean haha (or rather muahahaha jk). Well, I don’t really need to do this experiment to know that this stuff really works. I mean, seriously..it’s been close to two years girls. This stuff is AMAZING. So amazing, I decided to do a video review. I filmed this a while ago and finally had time to put it up now after Chinese New Year and moving to a new place so here ya go! If it doesn’t show up, play it on youtube! Sometimes there may be a glitch! Review: Getting my Hair done at Organic Hair Professional, an All Organic Hair Salon! Excellent tutorial and review, as always.